The beneﬁts of warm water underﬂoor heating in the home are well established: improved comfort, no intrusion on wall or ﬂoor space and low running costs. But did you know that the advantages of underfloor heating can also be experienced in conservatories, extensions and single rooms by adding it to the existing heating circuit? Where the structure is built (or upgraded) to meet current building regulations there will be sufficient insulation present to allow the UFH to work at low flow temperatures, so efficiency can be maximised and energy bills reduced. This is a really straightforward proposition; area packs, such as Nu-Heat’s OneZone®, are available for both screed and floating floors in various sizes up to 60m2. In areas larger than this or in two-storey extensions the system should be fully designed by an experienced supplier to ensure optimum performance. In the past fitting UFH in older properties has been challenging, which is why Nu-Heat has developed the LoPro™ range. Both LoPro™Max and LoPro™10 are low height profile systems which are laid easily over any existing floor. LoPro™Max is perfect for renovation projects, offering the highest heat output of any retrofit UFH system. The system uses a castellated panel to hold the pipe in place and this is then covered by a specialist self-levelling compound. Due to its impressive heat performance, the OneZone pack is perfect for extensions with large amounts of glazing and also conservatories. Another option, LoPro™10, is a composite gypsum construction with one-third less thermal mass than a screed floor, allowing it to heat up and cool down rapidly – making it more economical for retrofit properties and giving quick response times. Its low thermal resistance and high mass (15,5kg/m2) provide a high thermal output and solid feel underfoot. A well-designed floor heating system maintains a comfortable floor temperature through accurately controlling the water temperature entering the floor. Water is taken from the existing heating system, passed through the control unit and then pumped directly to the underfloor heating tube. The floor temperature needs to be raised only a few degrees above the room temperature to maintain an effective comfort level. Plumb into the existing radiator system and use the existing heating timer as the master control. The programmable thermostat supplied with the UFH will be able to call for heat in the room during the times set on the main timer, but not at other times. The room heating will switch off when the correct temperature is reached within these times. This is most effective when floor constructions with fast heat-up times are used. Bypassing existing system controls to give independent control over the underfloor heating system. Ideally, independent control should always be the preferred option. However this is dependent on the location of the room in relation to the existing system. Wireless programmable thermostats provide a major benefit when retrofitting UFH systems as they remove the need for potentially disruptive hard wiring. 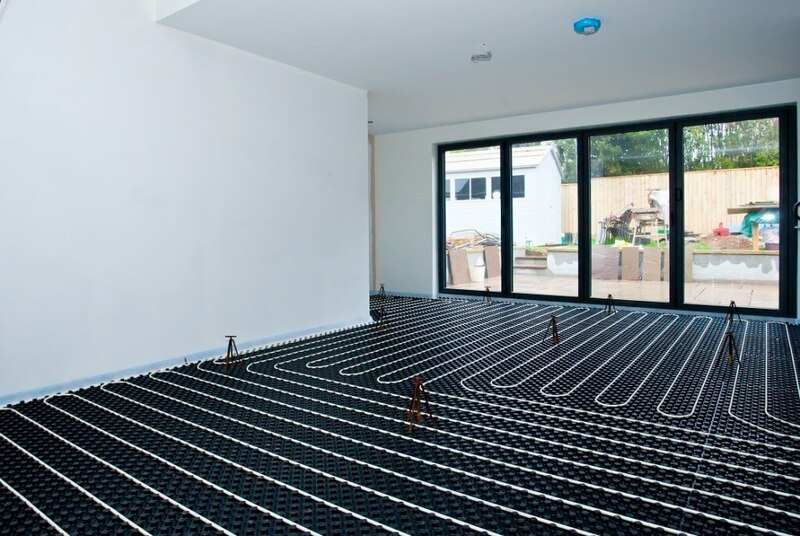 UFH in screed can provide heating of up to 100 Watts per square metre of floor area. This is normally more than sufficient to provide room temperature without supplementary heating, however it is important to ensure that the heat output from the floor will meet the heat loss of the structure in extreme weather conditions, especially in highly glazed areas such as conservatories; the supplier should be able to confirm this. By appropriate programming of the controls, rooms with screed floors can be heated to match the radiator system. Floating floors, LoPro™10 and LoPro™Max also offer good heat outputs and they warm up and cool down quickly, meaning the UFH can be operated with timings similar to those of a radiator system. There are very few restrictions on the type of floor covering that is suitable for use with UFH as long as some simple guidelines are followed. The choice of floor covering will impact on the eventual height build-up, and must be taken into account in projects with limited height availability. Ceramic tile, stone and marble all conduct heat extremely well and can be laid as normal with a de-coupling layer and flexible adhesive. Engineered timber boards can either be floated or fixed in place depending on the sub-floor structure. Carpet with underlay can also be used as long as the tog value doesn’t exceed 2.5.